Well, there are so many words spoken at any given minute that sometimes words seem a burden. I know that words are indispensable but sometimes, not too often, sometimes, I would rather seek refuge in smiles. Come to think of it, a smile can convey so many different things. The point is conveyed. The food tasted delicious! One had a good time indeed to the point of exhaustion! 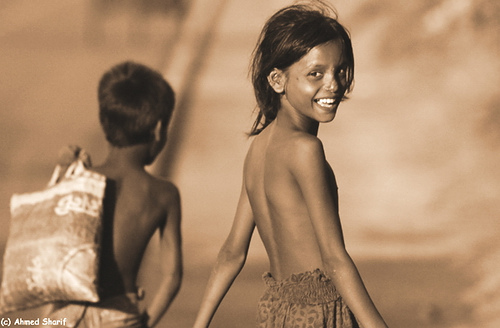 How often I have wondered about the language of smiles. How would the world look like if the only language we used was that of smiling and conveying our thoughts. Not possible for every thing but aren't most of our thoughts an outcome of exaggerated imagination. Smiling also saves a lot of energy. All one has to do is smile! No thinking of using the appropriate words. No bothering about diction/pronunciation/phonetics and other trappings. The anthropologists would not worry about dying languages. Well, I can go on and on. Sometimes words fail me but that does not mean I can do without words. But I am glad that I can atleast substitute words with smiles sometimes. As I sign off, a big smile to you from me. And don't forget to give a smile to someone who does not have one. So, what do you think of smiles? How can I forget? My dear friend Myrna's post prompted me to write this one on Smiles. When I was a kid, I was often amazed at the ability of grown-ups to eat crisp eatables rather soundlessly. I still continue to be amazed. 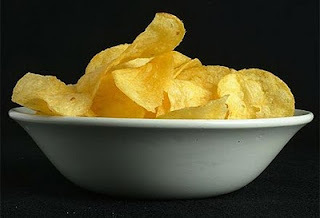 Sometimes at a meeting or gathering where we are offered crisps that make noise while munching, I observe that many people do it quite effortlessly. But I always have to struggle with keeping the volume of my munching low. I love the sound and feel of crisps but unfortunately I wonder if I am making too much noise while consuming those. Or another probability would be that I can hear those noises but not the others. But then there are certain eats which do make a lot of noise while being chewed in the mouth. I value food for its smell, taste, texture and even noise. If crisps aren't meant to make noise, why are they so made? Sometimes very small issues as these niggle me to no end. I always have the fear that people might think that I am not observing etiquette while in the midst of a group but then on second thoughts, why should I? The joy of eating crisps is in the munching, after all. Strange concoctions of the mind and eating habits. How do you prefer to eat your chips/crisps? Do you take extra care to munch it softly? If yes, you must be an icon of patience and civility. P. S: This post is only about eating crisps and NOT on the health stakes of eating crisps. Please do note the difference. During a chat with my room-mate, she expressed: "I wish I have you as my mother." Why? She feels that I take good care of her by sometimes making coffee for her and washing her cups. Well, this made me wander off in a trail of thoughts. I began questioning the archetype associated with mothers. Caring for one another and being affectionate are qualities that every human should possess by default (or am I expecting a bit too much, here). But when one attributes qualities as the ones mentioned above only to mothers, I start wondering. Why is it that every culture deems the mother as THE epitome of love, sacrifice, affection and care. I have always heard the very common phrase: "There can be no one like my mother." I, for a fact, accept that no human can be like the other but why mothers alone. Popular culture also propagates this grand idea of raising the mother to a pedestal. But there are problems in this type of deitifying a role. One: the mother is not seen as a 'normal' human who is prone to committing mistakes. Two: the mother has no individual personality except that of a nurturer, care-giver and a person who holds the family together. Aren't we placing an enormous responsibility on a human being by placing the weight of so many qualities and responsibilities? A mother goes to any length to sacrifice for the well-being of her child/children but doesn't the father also do the same in a different way. Culture demands that the mother be exalted at all times. But why? There have been instances when I have been reprimanded for even raising this issue of 'mother-worshiping.' Let it be clear here that I am not slighting the role of a mother. She is the one who brought me into this world. She carried me within her for nine months. But that does not mean that I see her as the highest point of every possible goodness. The mother I know is capable of committing mistakes, sulking when she finds the weight of cooking a tad too much and also complains that the world is too much extracting on the role of a mother. Well, this is quite a touchy subject. I would like to read your thoughts on this. You are free to condemn my thoughts, if you find that it is unpardonable. Thinking of bygone days and people from the past fills me with quite a bit of nostalgia. In fact, I can soak in emotion pretty quickly but after all that downpour, I ponder. As much as I would like to reconnect with people from a time that was wonderful, I wonder whether the same vibrations will pass while meeting all of them years later. I am often quick to suggest reunion plans, but the euphoria slowly fades away and I rethink on meeting up with old chums. Why? I don't much know. While it is quite nice to think that the same people once coloured a part of my years long ago, it does not actually excite me to think of coming together again. I would gladly meet one or two close friends but . . . This happens almost every time. I get quite happy and chirpy when I stumble upon a person from the earlier pages of my book of life but I quickly lose that enthusiasm. Mind you, the warmth is still there but I wonder what will I talk to them and how will I sustain a conversation. Now this is not a great situation to find oneself in. People can easily misinterpret that I am being snooty or insensitive but this is what happens to me. I find lost in reunion meetings. Well, I can manage for the first fifteen minutes when pleasantries and news are exchanged but after that, I yearn for the entire drama to be over. I cherish the memories but reconnecting in reality is a bit hassling for me. We all change over the years. While some deem it a great compliment to receive the phrase: "You have not changed a bit," for me it is an insult. How can anyone remain the same throughout the many many years. The figure remaining the same is worth two bits of compliments but personality. If not completely, atleast here and there some changes do happen. And the fodder for reunions are always nostalgic moments where we looked slim, dated hot guys, my daughter is this and my husband bought me that and blah, blah, which is a bit too stifling. I'd gladly pick up the bits but those bits cannot fit into the whole picture. So they are better left as bits from a bygone era. I guess I have rambled a bit too much here. And no, there was no gin and tonic involved. Maybe you like reunions and can give me some advice on how to go about it.